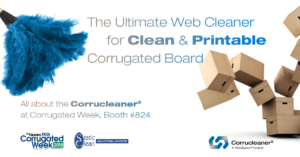 The Corrucleaner® web cleaning solution for corrugated board and cardboard production is developed by Weducon®. With over 30 years of experience in the field of web cleaning, Weducon develops and produces solutions for dust problems which arise during the production of corrugated board, board, paper, paperboard, film, textiles, tissue, glass, nonwovens and other moving substrates. Our customers include both end-users and original equipment manufacturers. The people behind Weducon started out in the paperboard and packaging industry and developed a well-known web cleaning solution (Cleanflow®), established in a broad range of applications and industries. A large part of the success of this web cleaning solution we have to thank our customers for because their feedback and trust led to the development of a product that achieved the best results for industry-specific needs and applications. Germany 2002: interacting with the customer (packaging board manufacturer) to find the perfect web cleaning solution for cut-size packaging board. The principle of listening to our customers’ needs to optimise their production, lies at the basis of our next generation of web cleaners. Weducon is looking continually for ways to perfect its web cleaning solutions and implement new techniques and insights to enhance web cleaning results further. New printing technologies enable direct printing to surfaces that in the past needed a much more complicated process. But to use these printing possibilities, the printable surfaces need to meet a high standard and must be as free of dust and particles as possible. It is evident to us that the call for healthier working conditions, a less energy consuming production process and clean packaging demands, asks for a constant critical analysis of the methods we use to optimise production processes. It is Weducon’s mission to provide the most efficient solution for the removal of all unwanted particles from moving surfaces, webs and sheets. And for our customers to achieve optimal results by lengthening wash-up distances, increasing the number of imprints, improving quality, stabilising fluctuating process parameters and increasing customer satisfaction. Read more about how the Corrucleaner® works and what is different about it or get in touch to discuss your production and specific demands.